Major international cargo corridors literally converge to form a “T” on Tucson, creating a lucrative opportunity as a logistics crossroads. To move products to market, the region’s air, highway and rail networks are a strategic strength. To the west, the Port of Long Beach in California is overflowing with containers from Asia and other global suppliers. In Mexico to the south, the seaport at Guaymas, Sonora, is aggressively expanding its infrastructure. And to the east, offloaded cargo in Houston is re-loaded for distribution by rail and truck. Hiremath made his remarks before about 150 attenees at the Sonoran Region Business Development Conference May 18. The event, put on by Caballeros del Sol and the Metropolitan Tucson Convention and Visitors Bureau (MTCVB), was held at the Westward Look Wyndham Grand Resort and Spa. Attendees included representatives of economic development, business and government from Southern Arizona and the states of Sonora and Sinaloa in Mexico. MTCVB vice president Felipe Garcia challenged the group to think globally, beyond the congested shipping issues in California and Texas. For the Tucson region, “it is supply chain opportunity. More money in Sonora will translate into more visitors to shop and businesses to invest in southern Arizona,” Garcia said. Specifically, Ford Motor Co. is investing $1.3 billion to expand its manufacturing facilities in Hermosillo, Sonora. In addition to production of the 2013 Ford Fusion, the company will expand production there of the Lincoln MKZ. 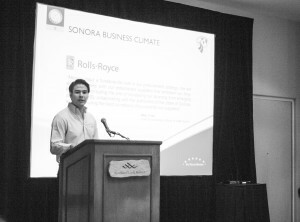 “In the automotive industry, Sonora has a distinguished reputation for producing high-quality products at very competitive operating costs. The Hermosillo plant is recognized as one of the best in the world,” said Ricardo Brown, representing the Sonora Economic Development Council. There are about 80 automotive companies employing more than 50,000 people in Sonora. There are more than 20 international suppliers co-located at Ford’s plant. The company’s expansion plans will add 1,000 direct jobs to an existing base of 3,400 workers, plus another 7,000 indirect jobs. Additionally, for the construction phase alone, 1,500 temporary jobs will be created. “We have a very strategic logistic location. We have connectivity to the deep water seaport in Guaymas and access to the U.S. east and west coast. Automotive is our priority and we also have major industries in aerospace, mechanics, IT, electronics and medical,” Brown said. Guaymas is seen as an up-and-coming aerospace cluster. In April, the aerospace division of Rolls-Royce announced plans to open a procurement office for components for its jet turbine engines. Seventeen aerospace companies, including Sargent Aerospace & Defense and Honeywell International, already operate there. Brown said auto partnerships are being pursued with car makers Audi, Toyota and Hyundai. Each company is interested in taking advantage of the region’s logistics, trained workforce, and access to the U.S. market. That is the greatest opportunity for Southern Arizona, “to get involved in developing the supply chain.” Brown said more regional companies would be welcome, to support or replace existing suppliers in California and Detroit. “The door is always open to supply companies coming in,” he said. Establishing a “regional view” toward global commerce is an extremely valuable step, added the MTCVB’s Garcia. The Tucson region is competing with trade corridors around the world. On both sides of the border, “everyone will benefit by pulling together as a region. The connectivity, it starts in Marana and goes all the way south to Sinaloa. That is our logistics region, so let’s think and act that way,” he said. Another positive step would be re-establishing passenger train service between Tucson and Mexico, Garcia added. Taking a cue from Oro Valley’s Hiremath, Honea hung out the Marana welcome mat.